Is there anything more American than hotdogs and apple pie? Yes. Yes there is. It’s baseball. The answer is baseball. It’s a game that has permeated the American culture and inserted itself firmly into so many of our lives. As such, it comes as no surprise that there are a plethora of video games available based on the sport. From the NES to the Wii U and even the Virtual Boy, Nintendo consoles have seen their fair share of Baseball games. Originally released in Japanese arcades and eventually ported onto the NES, Bases Loaded – not to be confused with Nintendo’s own Baseball – is a pure and simple sports simulator. When starting the game, you can choose to play through a season or play a single game against a local friend, but beyond that there isn’t much else to do here. 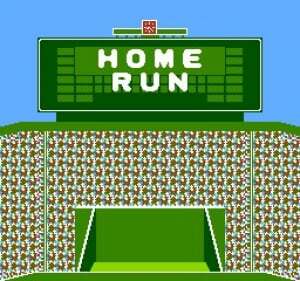 There’s no Home Run Derby or pitching practice — just pure, unadulterated, 8-bit baseball. There’s no real point in explaining your goal in this game as it exactly replicates the more than 150-year-old sport on which it is based. Regardless, after selecting from one of 12 fictional teams, your goal is to score more runs than your opponent throughout the course of nine innings. During each inning, both teams get a chance to bat – which amounts to offensive play – and an opportunity to pitch and command the field – gameplay that equates to defense. Whichever team earns the most runs by the end of the ninth inning wins, and whichever team has the most wins over the course of the 100 game season wins the series. This game follows what is essentially a simplified version of traditional MLB rules that have been slightly altered to be more accommodating to casual fans. For a game as featureless as Bases Loaded, the control scheme is surprisingly complex. When batting, pressing A while holding a direction on the D-Pad allows you to alter the height of your swing to match the oncoming ball, and pressing B causes you to bunt. Holding different directions while pitching causes you to throw different types of pitches at varying heights. Fielding the ball is a bit cumbersome as there isn’t really an effective way to guide your players to make a proper catch. The way that the camera pans makes it impossible to identify where your players are located in the outfield, often creating reason for a very frantic chase that should have resulted in a catch. Once the ball is in your hand, throwing back to the diamond is as easy as choosing a directional input and pressing A. The controls are involved and may take a bit of getting used to, but once you’re become accustomed to how it all works, everything makes sense and feels natural. While it’s easy to say that most games approaching the 30-year mark have not aged gracefully, Bases Loaded revels in its simplicity. Obviously modern takes on the game – such as the colossal MLB 14 The Show – encompass more aspects of the sport and delve into the intricacies with greater detail, but this aging simulator still does well enough to stand on its own. An innovator in its genre, Bases Loaded introduced the behind-the-pitcher view; something that is still used in games today. It also features some of the largest and most detailed character models that we’ve seen in an NES game. Despite all that it has going for it, an old featureless game is difficult to defend in the realm of "fun". True fans of the sport or gamers seeking a bit of nostalgia will get a kick out of this one, but it’s a difficult recommendation for gamers used to modern iterations or casual fans. Unsurprisingly, as with every other Virtual Console game on the Wii U, the GamePad’s small screen displays exactly what is present on your television as well as allowing access to the VC menu. The ability to create save states is really a blessing for this game as it allows you to easily continue your season without having the write down and input the long codes given to you to resume your progress. Off-television play is also perfect around this time of year as it allows you to watch an actual baseball game while continuing on with your own season. Let’s get serious for just a moment and say that you can never, ever have too much baseball. Bases Loaded is not a perfect sports simulator, especially when compared to modern entries in the genre, but it still has a lot going for it. An innovator in its field, this is a game that we still see aspects being drawn from even as technology continues to pull further and further away. The controls take some getting used to and it’s mostly featureless beyond the core game, but anyone looking for a classic baseball video game could do much worse — just don't got expecting too much. The pitcher on the title screen looks like Gallagher. This game was a big milestone back in the day as far as getting a descent game of baseball in a video game. Bases Loaded II was better. Overall, these games weren't my fave to play....but again, imo, they were stepping stones. I love how they can release this on Virtual Console but not Pokemon TCG. 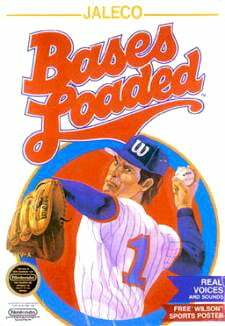 loved super bases loaded as a kid. (my favourite snes baseball game) but I feel world series baseball was the best 16 bit baseball game...as for 8bit..RBI was the best. Wh-what!? 5 out of 10? Bases Loaded is absolutely one of the best baseball games on the NES, right up there with RBI Baseball. 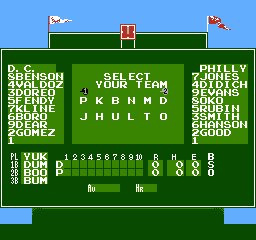 I still plug in Bases Loaded (2 more than 1, admittedly) in my NES for good times. 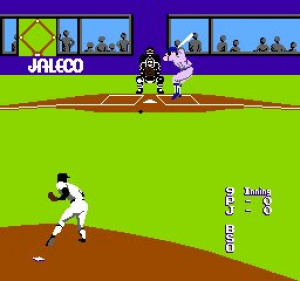 RBI was solid, but there is a better baseball game for the NES. Thought Baseball Stars was the best. (Or maybe that should be least bad. 8 bit sports games were terrible most of the time).